Wonderful Hilltop Chalet in beautiful Pine Mountain Lake near Yosemite. Lot 274. On .50 acre lot with circular driveway corner lot, 2 car garage. 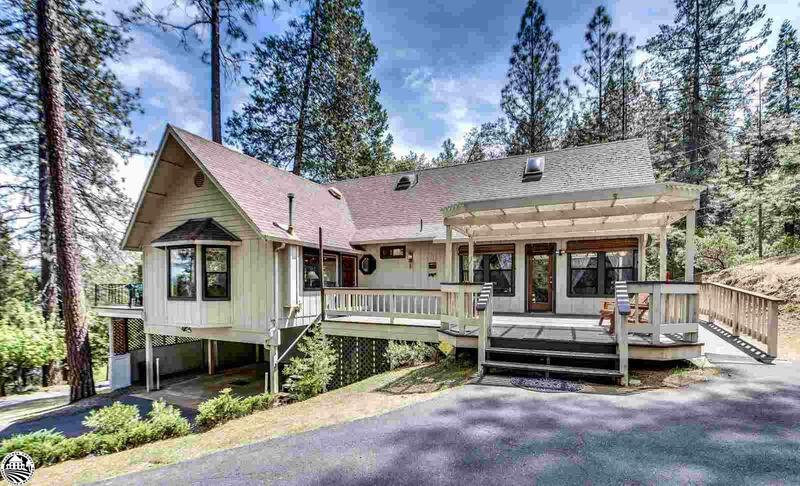 Experience tranquil living in your very own 3bd 2.5 bath cabin home with beautiful mountain views and natural landscape close to Marina and Golf amenities. Enormous Great room with a chef&apos;s delight spacious kitchen. Dining, breakfast nook and breakfast bar, over 12 feet of Corian counter space with a huge walk-in pantry room, beautiful hardwood flooring, open beam ceilings plus vaulted knotty pine ceilings in living room and in both over-sized upstairs bedrooms. Lvrm has efficient pellet fireplace heat stove plus bright windows, built-in book shelf. Private BBQ patio Trex deck. Main level 1/2 bath, Laundry room with sink, and Large master w/deck access, double closets, beautiful dark laminate flooring, dbl sinks, separate shower and large jetted bathtub. Upstairs has huge cabin style bedrooms with skylights and hall full bath. Space, parking, cabin style, great room, garage, 2 large decks, privacy, views, great room open kitchen large master, this home has everything to offer! Pine Mountain Lake is located in historic Groveland, CA and has Lake, Marina, 18 hole Champion Golf Course and Country Club, Airport, Horse Stables, Tennis and Pickleball Courts, and more in a mountain landscape gated community. Gate pass required. Low HOA dues $188 per month. You too can be living the Dream in Pine Mountain Lake!